Dislike: Lack of low bass, high price. 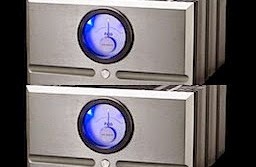 I have been a big fan of Westlake audiophile, cinema and professional speakers since the early 1990s. As founder of Pro Audio Review and as a freelance audiophile reviewer, I reviewed a number of Westlake speakers, including the versatile Lc8.1 and the Lc2.65 center channel (both still used as reference in my home theater system). 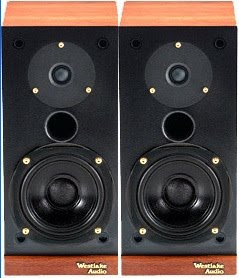 Westlake Founder/President Glenn Phoenix continues to find ways to up the quality on his passive speakers; those improvements also apply to the baby of the Lc line: the Lc4.75 mini two-way monitors, priced at $3,200 per pair for hi-fi finish version. The made-in-USA US Lc Series features a number of speakers, ranging from the 4-inch woofer to dual-6-inch and single 8-inch woofer models, all using the same tweeter in various cabinet sizes. 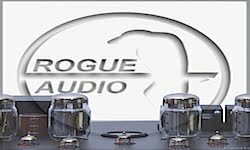 They have been popular in professional and audiophile passive speaker/amp combo setups. As with all Westlake speakers, since its inception in 1971, there is no scrimping on quality anywhere in the speaker. Thus, the price is not cheap at the $3,200 hi-fi pair price (pro version in plain black is $2,700 per pair). The Lc4.75 is a compact mini-monitor with a 4-inch woofer and a .75-inch textile dome tweeter, configured in a ported, bass-reflex cabinet. The .75-inch MDF cabinet is extremely well-braced and inert to prevent unwanted cabinet resonances. The drivers and crossover components are ultra-matched, and tested to tight tolerances. Bucking the trend of metal drivers, is a European-made silk dome tweeter and a composite-pulp woofer. I am still a big fan of soft dome tweeters and the Westlake driver is a good one. The speaker is available with or without video shielding. The Westlake Lc4.75 is a versatile, two-way loudspeaker that can match up well with its big brothers in a surround system, or they can be used as mains in a small audiophile listening room or recording studio rig. Internally, the woofer-to-tweeter crossover is set at a higher-than-we-typically-see in loudspeakers — 4.5 kHz. Since the bass/mid-driver is only four inches, it performs well past the typical 2 kHz to 3 kHz crossover band — without audible holes in the coverage. A basic measurement with test tones, using an Audio-control RTA-3050, real-time analyzer, confirmed a very tight response from 2 kHz - 5 kHz. The front-mounted port, bass-reflex design helps squeeze all the bass it can from the small-size cabinet and little woofer. Rated frequency response is 65 Hz to 20 kHz, plus or minus 2 dB. (With RTA measurements in my room, response rolled off pretty fast under 80 Hz). Sensitivity is a bit lower than many modern speakers at 85 dB 1-watt/1 meter, but I was able to drive the pair to plenty loud levels even with a low-power, single-ended solid state First Watt amplifier. Overall, the speaker measures 12-inches tall, 5.5-inches wide and 7.25-inches deep. Weight is 12 pounds each. The Lc4.75Fs (hi-fi) are available in North American Satin Walnut finish. The basic Lc4.75 that are sold to pros are black only; I personally like the plain black. The front grill is removable, and is more of a “transport” grill than a “listening” grill; the speaker has an airier naturalness, in its sonic presentation, without it. Westlake also sells an optional speaker “Muff” for the Lc4.75. The Muffs ($194 for hi-fi pair; $159 for the pro pair) are claimed to make the midrange and treble a bit smoother by reducing cabinet-edge diffraction. I tried the Westlake with and without the Muffs, but in my room, I only noticed a very slight tonal change when listening to the speakers from a few feet away. 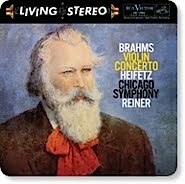 I could not hear the difference at six feet or more with this speaker. All Westlake speakers have been updated with what Glenn Phoenix calls a “Low-PE distortion reduction design”; this patent-pending process is the result of Phoenix's research on a discovery that he calls PE distortion, or “Phoenix Effect.” Phoenix claims that PE distortion is unmeasurable by conventional testing procedures and contributes greatly to negative sonic artifacts, such as transient harshness and unnatural ambiance and tonality. This occurs even if the components are seemingly well matched, according to Phoenix. The two-driver setup provided a smooth midrange and treble — without the overly excited high-end of some metal dome tweeters I have heard. Just natural sound and a welcome lack of excess sibilance. This tweeter is really good. Phoenix said the Low-PE fix implemented in his speaker allows it to perform at its optimum without harshness and subsequent ear fatigue. The Low-PE mod, he added, can be done to the electronic components as well. (I have listened to Low-PE speakers and the Low-PE cables for more than 10 years. I don’t know if it is the Low-PE design, but Westlake speakers are some of the most natural and smoothest speakers I have heard — especially in the crossover region where the ear is quite sensitive). Because of patent issues, Phoenix is rather secretive about his Low-PE techniques added to his speakers. But since a passive speaker does not have that many components and all are passive, I would guess that the PE distortion remedy has to do with its special wiring in the Westlake speaker components. Whether you believe in PE distortion and Phoenix’s application of a fix or not, Westlake speakers have always been top-class performers, and that term also applies to the diminutive Lc4.75. I evaluated the Lc4.75 in several scenarios: as main audiophile speakers in a nearfield listening position, a set of small compact monitors for the home recording studio, and as rear surrounds for my home cinema system. I drove them with several amplifiers, including Pass Labs X350.5 (350wpc), First Watt F3 single-end solid state (7wpc), and a Bryston 14B SST-II (600wpc). I also linked them to an original Macintosh MC275 stereo tube amp (75wpc). In the home cinema system, the speakers were driven by a made-in-USA Carver A-750X (3x250wpc for the front channels) and a A500X (250wpc for the rear channels). Speaker cables included Alpha-Core solid-silver and solid-copper single conductor cables, Westlake speaker cables, and zip cord from Radio Shack (the old Mac’s favorite cable). The Lc4.75 contains five-way binding posts, but were more accommodating to spades and banana plugs than bare wire. 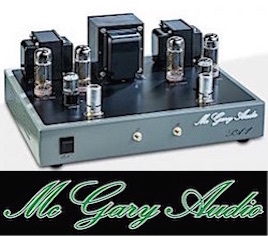 The amps were linked to several different preamps — depending on the application: Legacy/Coda High Current preamp, Benchmark DAC1 Pre D/A, Rogue Audio Model 99 Magnum audiophile tube preamp and the Lavry DA-10 DAC/pre. Sources included an Oppo BDP-83 SE universal player, Esoteric DV-50 universal player, Macbook Pro and Mac G5 computers. All sources were auditioned with either internal converters or through one of the external DACs. Amps, preamps and sources were linked via Westlake Low-PE Distortion line-level interconnects or Alpha Core-solid silver interconnects. All components were AC-connected with Essential Sound power cords. Having heard the original version in the 1990s, I was familiar with the Lc4.75’s sonic signature, which is very accurate within its bass-limited small size. However, with reinforcement from the walls, the lack of deep bass is not always noticeable with many kinds of music, including acoustic guitar and solo classical instruments. The two-driver setup provided a smooth midrange and treble — without the overly excited high-end of some metal dome tweeters I have heard. Just natural sound and a welcome lack of excess sibilance. This tweeter is really good. On the DMP SACD Steve Davis — Quality of Your Silence, a great test disc for detailed percussion playback, such as drum cymbal transients, was appropriately apparent, but never exaggerated. Imaging was pinpoint with a strong stereo spread from L-R and good front-to-back placement of the instruments. Of course, it lacked the deep impact of the bass guitar, but some of the bass was evident. On the Groove Note SACD, Anthony Wilson Trio - Our Gang (Gibson jazz guitar, Hammond organ and drums), the organic quality of the organ and tube guitar amp — noise and all — came through loud and clear. Warm and tubey with a nice, open stereo spread — especially with the drum cymbals. A piano is used on several cuts of the Davis album (an exquisite Steinway grand, according to our own Tom Jung, who engineered the recording in 1998). The combination of the instrument tone, the room and high-res recording technology make it an excellent sample of really well-recorded piano. Like other quality speakers I have tested, the pint-sized Westlake, reproduced the upper-register piano tinkle with much of the dimensional accuracy I hear when played on top-class systems. Bless that soft-dome tweeter! On the Groove Note SACD, Anthony Wilson Trio - Our Gang (Gibson jazz guitar, Hammond organ and drums), the organic quality of the organ and tube guitar amp — noise and all — came through loud and clear. Warm and tubey with a nice, open stereo spread — especially with the drum cymbals. The warm midbass emphasis of the organ was a bit diminished, but it is, after all, a small speaker. By the way, I set up the Lc4.75 with a subwoofer, a Canton 10-inch powered subwoofer. I set its crossover to 80 Hz and connected it to a fixed line-out on the Coda preamp. The extra bass from the sub allowed the Westlake/sub combo to become a full-music speaker system; the crossover set at 80 Hz worked perfectly in my room. The combo conveyed music bass coverage to 40 Hz, plus the tight midbass and nice-sounding midrange/treble from the Lc4.75s completed the sonic spectrum. I also auditioned the Lc4.75 as a set of main L-Rs in the home cinema system — and as the two rear surrounds in the 5.1 setup. With the Paradigm Pro 15 subwoofer crossover set at 80 Hz, the small Lcs did a good job in my room, which is medium size. My normal L-R speakers are Westlake Lc8.1s; a Westlake Lc2.65 anchors the center, and two soft-dome tweeter NHT Ones bring up the rear. 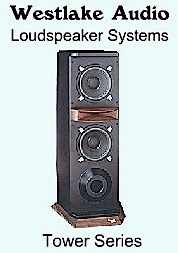 Substituting the Lc4.75s for the L-R Lc8.1s, the home cinema sound signature was close to the big brothers’ sound (they have the same tweeter design). I had to add more gain to the channel input settings for the Lc4.75s during set up. They are not quite as efficient as the 8.1s. With the little guys installed into the test system, Blu-ray movies and music sounded pretty good; they could get over 95 dB pretty easily. Not quite as full sounding as the 8.1s, but I could envision a full Lc4.75 multi-channel system for use in small rooms — as long as you used well-matched amplifiers (or a good receiver) and a powered subwoofer. In the rear surround configuration, set to the “small” speaker setting in the Onkyo pre/pro, the Lc4.75s matched up well with the Lc8.1s/Lc2.65 Westlakes up front. The rear ambiance and directional effects were as good as my NHT Ones, which are dipoles. The rear sound effects from aggressive soundtracks remained smooth with the little Lcs. I played prerecorded music and my own home-brew 24/96 and 192 kHz acoustic guitar recordings. The Lc4.75 speakers shined their sonic light on the stringed instrument music, minus the deep bass. And even in a spread of only four feet, imaging detail was very good. The Lc4.75s made for revealing close-field monitoring tasks in my home recording studio. With a Mac G5 and a Lynx L22 soundcard, I output up to 24-bit/192 kHz audio to a Legacy/Coda preamp and Bryston 14B SST II amp, which in turn, drove the little Westlakes. I had the speakers positioned on stands at ear level, slightly canted in and three feet from my position. They were about eight inches from the back wall. I played prerecorded music and my own home-brew 24/96 and 192 kHz acoustic guitar recordings. The Lc4.75 speakers shine on all kinds of music, minus the deep bass, and even in a spread of only four feet, imaging detail was very good. Compared to my Legacy Studios HDs, which have 6-inch woofers and ribbon tweeters, the Westlakes had less deep bass and were slightly “softer” on top, but they imaged just as well. The Westlake Lc4.75 is a versatile, two-way loudspeaker that can match up well with its big brothers in a surround system, or they can be used as mains in a small audiophile listening room or recording studio rig; you just won’t get any deep bass. Also, I could see using five of Lc4.75s — as a 5.1 system with a powered subwoofer — in a small multichannel video or audio room. As with all passive speakers, you just need good amps. At $3,000+, they ain’t cheap, but the economic realty of producing hand-made, manufactured-in-USA products with this much quality means you need a fat wallet. I liked the original Lc4.75, and the latest version slightly betters it. 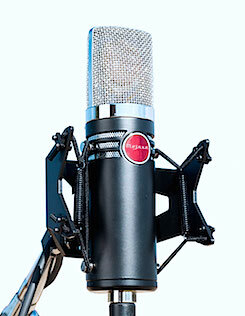 The Lc4.75 also nets a 2010 Stellar Sound Award. For more info, click WestlakeLc4.75.